Two or three times a month I have a BLAST playing guitar at Shoal Creek Community Church. Last summer we covered the Who, Janis Joplin, Blood Sweat & Tears, Jimi Hendrix, and more in a celebration of the music of my generation. Best of all, my son, Philip, played in the band with me. I was in heaven. But sometimes I wonder, is this legitimate? I mean, we invest a lot of time, energy, and money in our Sunday services. Are we reaching people? Are we making a difference? Last week I read Jennie’s story. She and her husband were searching for answers to spiritual questions, and found what they were looking for at Shoal Creek on Christmas Eve 2010. Their story, and others like it, remind me that what we do on Sundays and special holidays is totally worth it. It’s okay to have fun at church. 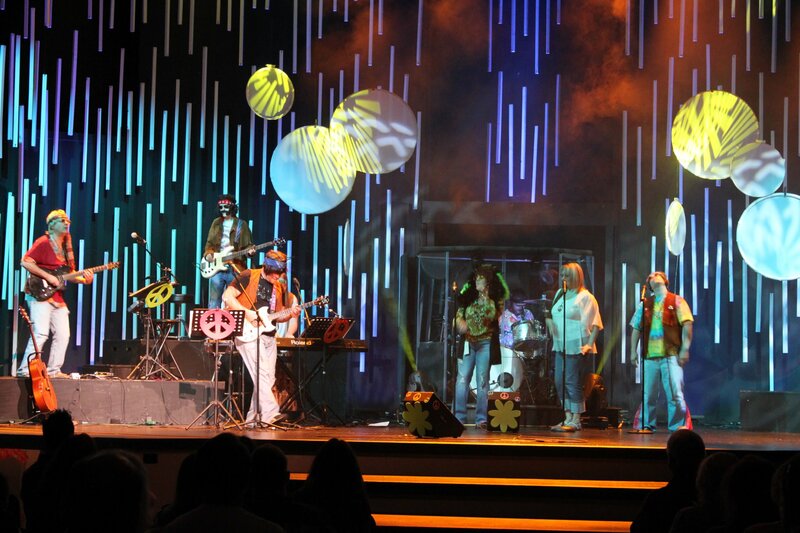 In fact, if you aren’t having fun at your church, there is probably something wrong! God meant for us to be joyful. That’s why we sign Joy To The World at this time of year. Christmas is a celebration of how God became human so that His joy might be in us, and that our joy might be made full (see John 15:11). Growing up, Kenny and I had very different “church” experiences. Kenny faithfully attended with his family every Sunday until he left for college. Although, it was more like a location for an obligatory appointment. God did not receive much mention except for that weekly hour. For me, church always left me wanting more. I learned to distrust the institution of “church” during my parent’s divorce in early childhood. My family became unwelcomed by our home church, and my grandparent’s church made me feel like an outsider from a broken home. Because of this, the majority of my life has been spent avoiding the church. Though Kenny and I were both spiritual, religion was not a part of our relationship with each other. We talked about God while dating, and knew that we wanted to pursue our faith, but we had so many questions. It was overwhelming and intimidating, so we just lowered the priority and went on with our lives on our own. We married in a small non-denominational ceremony, officiated by an ordained lawyer in a campus chapel. It painted the perfect picture of where we were spiritually – we wanted God in our lives, but weren’t sure how He would ﬁt in, so we included him just enough that we weren’t intentionally leaving him out. Our marriage was always good, but there was element of our relationship that felt empty. It wasn’t until the birth of our daughter Kyla that we began discussing God, and his role in our lives, again. The topic of Kyla’s baptism created a lot of stress in our relationship, primarily due to family expectations. God wasn’t a major player in our lives, so we felt it hypocritical to have a ceremony that symbolized otherwise for her. Additionally, we didn’t belong to a church, and I wasn’t even baptized myself. Ultimately, we followed our hearts and decided to do what was right for us, not our families, and not pursue her baptism. And again, the topics of God and church were pushed aside. As we approached our ﬁrst holiday season as a family, it became increasingly apparent that we wanted, and needed, something more. We felt very isolated and alone. While Kenny coped by throwing himself even more into his work, I secretly began church shopping, online. I longed for a community of friends and a place to explore my faith. We didn’t know many people in the area, and didn’t know anyone here who attended a church regularly. I had noticed Shoal Creek before, by driving by, but hadn’t paid much attention. When I found the Shoal Creek website, it was a different story. I liked what I read, and I wanted to learn more. So, I began watching the services online, and I was captivated. I couldn’t wait to share my discovery with Kenny, but he was skeptical. Understandably so. But, it re-introduced a dialogue of religion and faith. I craved for more out of Christmas for our family. I wanted it to be more than just the presents, the food, the sleeping in (which let’s face it, as new parents was impossible anyways). I wanted to celebrate the true meaning of Christmas, but wasn’t even sure what that was. We ﬁgured that going to church on Christmas Eve was a good tradition to start. If we didn’t like it, we wouldn’t have to go back. There wasn’t anything to lose. And besides, our daughter had an adorable party dress that wouldn’t have gotten worn otherwise! I still remember our nerves as we got ourselves ready for church that evening. We obsessed over what to wear, worried about being judged for being too dressy or too casual. We over-packed the diaper bag full of distractions for our baby girl, anticipating that she would become restless from a long, drawn out and boring service. The drive to church that night was a long one. Five minutes felt like eternity. So many “what if’s” went through our heads, primarily negative ones. It took a lot to get us to the point of trying church together, and we really wanted a positive outcome. We walked in to the auditorium and took a seat toward the back, probably much like the other once per year attendees. I remember looking around and seeing all of the kids playing in the aisles before the service, and the interactions between many young families. So many smiles. And I wanted that for my own. As the lights dimmed and the music started we quickly realized that this was a church unlike any we could have imagined. We were blown away from the very ﬁrst song. All of those preconceptions of a Christmas service were quickly changed. We felt welcomed, we were wanted. The people sharing their stories were so real, relatable. The message that night spoke to me personally in such a relevant way. Tears ﬂowed down my cheeks as I listened to church members being so honest. We weren’t alone. God was with us. My husband held my hand tight. And for the ﬁrst time in a very long time, I prayed. I asked God to please impact my husband’s heart as He was inﬂuencing mine. On our drive home, with my eyes still full of tears and overcome with emotion, I asked Kenny if we could please come back to Shoal Creek. There was no hesitation in his answer. With that beginning, Shoal Creek has become our home. We never expected to get out of a church what we have gotten from Shoal. We not only found a place to worship, but a community of people who have completely changed our lives. We have started a spiritual journey together and it is incredible. We are learning, growing, and evolving. God has become a major player in everything we do. We still have a lot of questions, but we are in an environment that makes it okay. This journey is an exciting one, and it is amazing that it all started with the simple desire to start a Christmas Eve tradition. If you live in the Kansas City metro and are looking for a place to explore the meaning of Christmas, please join us at Shoal Creek Community Church – December 22 and 23 at 7pm, and December 24 at 5pm, 7pm, & 10pm. If you live outside the metro, you can watch live and previous services here: http://www.shoalcreek.org/video?albumId=266357&videoId=33169719. PS If you have a similar story, please share it in the comments below. Read your story at Sonia’s and linked over. This story by Jenny is also inspiring. As a minister I always hope that something we do on a given Sunday is going to make a difference in someone’s life. Tesitmonies like these keep us hoping and working and especially trusting that God is doing something in his church today. Good post. Thank you, Warren. As a volunteer at my church, these testimonies are better than any paycheck I ever earned! I am so happy to have read Jennie’s story about Kennie and her daughter and what the Christmas service did for her family in 2010. Plus I have to say I enjoyed watching you in person playing the guitar, especially after having read about your volunteer work with the youth in Poland, and your approach with music. Personal stories are so powerful, aren’t they? Jennie and Kenny’s story will be part of the 2011 Christmas Eve service, and the ripple effect just keeps on spreading! Thank you very much for reading and for taking time to comment.